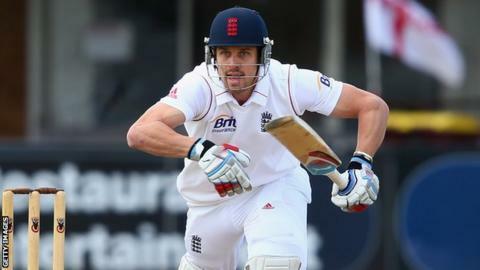 Nick Compton has set his sights on claiming one of the vacant spaces at the top of the England batting order. The Somerset batsman, 30, has played in nine Tests since his debut in 2012 but missed out on an Ashes call-up. However, without a settled top order and management team following the 5-0 defeat against Australia this winter, Compton believes he can earn a recall. "I think everyone in the top three for their county will think they've got a good chance," he said. "Right now, I think I have as good a chance as anyone. I feel like I've done a good job over the last three years, I've been consistent and scored runs. "I don't know if that's the whole criteria. There's a new regime coming in so they've got to decide what they're looking for." England's next Test series starts in June against Sri Lanka, but the England and Wales Cricket Board has yet to name a replacement for Andy Flower, who left as head coach following his side's whitewash in Australia. And the battling line-up is also in flux after the sacking of Kevin Pietersen and the departure from the Ashes tour of Jonathan Trott on health grounds. Captain Alistair Cook opened alongside Hampshire's Michael Carberry in the winter Tests, but Carberry may have hindered his chances of another call-up after criticising England selectors for his omission from the one-day squads. Warwickshire's Ian Bell and Yorkshire's Joe Root are also candidates to bat in the top three. "That place hasn't been nailed on," added Compton. "I've heard Joe Root might be batting down in the middle order so there's a chance for someone to stake a claim. "Who that's going to be will depend on who does well at the start of the [county] season." South Africa-born Compton earned his first international call up in September 2012, after finishing the County Championship's top scorer with an impressive 1,191 runs from 11 matches, batting at number three. But eight months later he was dropped by England after scoring 39 runs in four innings against New Zealand, despite having made consecutive centuries in the previous series. "If I'm honest, I didn't take the opportunity with two hands," said Compton of his time with England. "I gave someone else the opportunity by not performing as well as I could have in the Test at Headingley. "It makes you realise you can't take anything for granted. Once you've got it, you've got to hold onto it. "Next time, I'll take those nine Test matches I've had and go in with a different perspective. I still have a lot to add." BBC Somerset will be previewing Somerset's 2014 campaign in a special hour-long programme on Thursday, 10 April from 18:00 GMT - available via BBC iPlayer. England's Test team: Who stays? Who goes? Read more on Ashes 2013-14: What is England's best Test team for Sri Lanka?